Eight Chinese Coins set: Round shape represents heaven, square represents earth. The eight coins symbolize prosperity. Hang it in the north west or west of your office or home. Dragon Turtle 龙头龟: This is a traditional Chinese celestial animal. It has a dragon head and a turtle body, and sits on a pile of Chinese money. It is a symbol of wealth and honour. We put it in the position of the Grand Duke. 2013 is a snake year, the position of the Dragon Turtle is south east of your office or home. Qi Lin 骐麟: The celestial animals. They are one of the vehicles of Buddha or Saint in Chinese culture. Qi Lin symbolizes positive energy. In feng shui, we use it to ward off evil intention and to combat the annual three killings. in 2013, the position of Qi Lin is the East. Display a pair of Qi Lin in the east of your office or home. Red Chinese Feng Shui Knots 中国结: This is one of the traditional Chinese symbols for good meanings. The main body of the knot is made of one single string, the shape of this particular red knot is love, family and harmony. It is an excellent object to be hung on the east in 2013. In 2013 the conflict star is landing in the east, the red Chinese knot is a perfect symbol to combat this negative star. 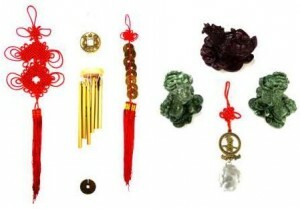 The six red hollow metal wind chime: This wind chime is modified by Mina Zheng for feng shui use. It consists of six metal hollow tubes, with a large lucky coin on top, and a small coin at the bottom. The smaller coin has Tao symbols and spells for protection. This wind chime symbolizes powerful metal energy, and it is perfect to be hung in the centre of the office or house in 2013. In 2013, the negative star Five Yellow is landing in the centre, we can use this wind chime to deplete the negative energy. The feng shui crystal: this is a crystal ball with a lucky coin and a red Chinese knot on top. It has very good meanings. We can hang the crystal ball in the north east, north, and south east windows to bring in the sun, and reflect the beautiful rainbow into your office or home. All the objects are enchanted.